Earlier in the week I decided that I would kick-off my fall sewing by starting an Ann T-Top. This was my first experience with a PDF from StyleARC (I should probably mention that they do not have PDFs for sale, these have been ‘freebie’ offers from partnered sites) and was pleased with how easily it came together. As much as I dislike having to tape together PDF sewing patterns, I really hope that StyleARC eventually offers some of their designs this way because it would cut down the international shipping timerates and give me more ‘instant gratification sewing’! Stitching this one was simple – it’s a very straight-forward design and I think even a beginner could easily sew up this shirt. As far as the fit goes, I actually think I could have gone down one size. It fits nice, although I think I would have preferred a slightly snugger fit all over (I should mention that my material is extremely stretchy and thin so I could get away with a smaller size. You probably couldn’t do this if you used a beefier material with minimal stretch). The scoop neck is flattering and not overly large (so you’re not constantly adjusting the neckline because you’re afraid you’re going to have a wardrobe malfunction) and the gathers at the sides add an interesting touch. They also make me feel slightly uncomfortable. Why? I’m pretty sure that I had a maternity top in this style 6 years ago and I’m afraid people will be asking me when I’m expecting. I know, I know. It’s totally a ‘mental thing’, but I’m pretty sure that if I saw this in a store, I wouldn’t buy it for the exact same reason. Even though I have a mental hang-up about this shirt, I’ll still be wearing it this fall. 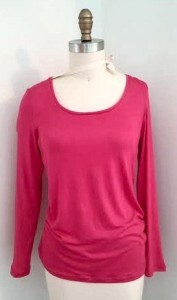 I love the color, the fabric is incredibly silky smooth, and it’s a comfortable style to wear…. I’ll just be sure to wear it with leggingsskinny pants so no one asks any questions! This entry was posted in General on August 22, 2014 by stacy.